We love red velvet at our house! 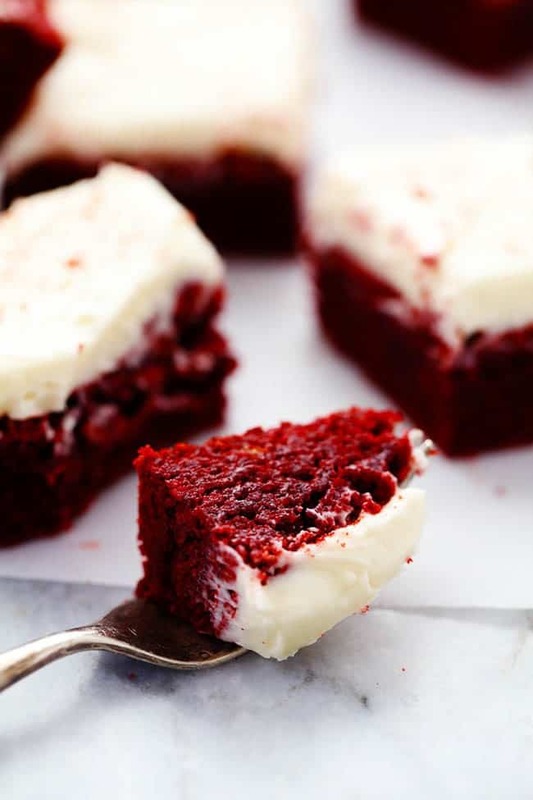 You can also try these Red Velvet Thumbprint Cookies, Red Velvet Sugar Cookie Bars, or this Red Velvet Pound Cake. These are literally one of the best brownies that I have ever had. I have been working so hard to lose those extra holiday pounds and finally was able to do it. I have really been trying hard to eat clean and watch what I eat. But as soon as I saw these brownies I had to make them! I am obsessed with all things red velvet and I couldn’t wait to reward myself with a treat! 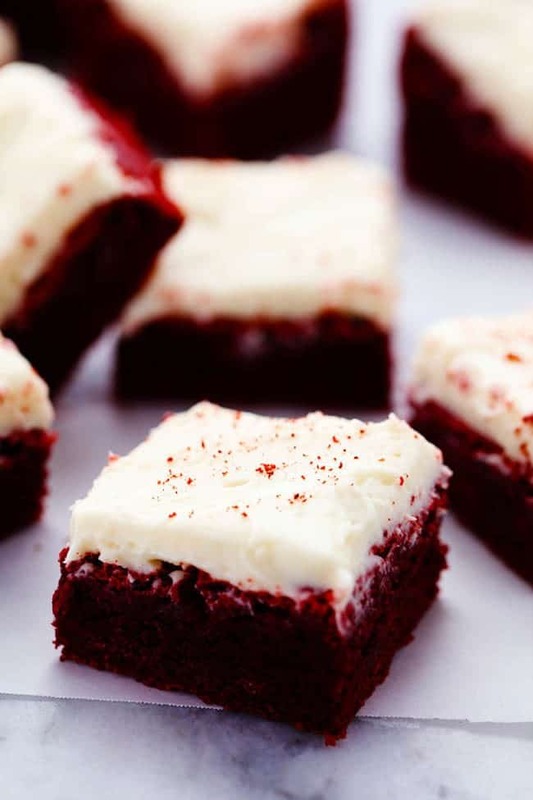 How do you make Red Velvet Brownies? Start by preheating oven to 350 degrees. Line a 9×9 or 7×11 inch pan with aluminum foil allowing 2 inches to hang over the sides. Lightly grease. 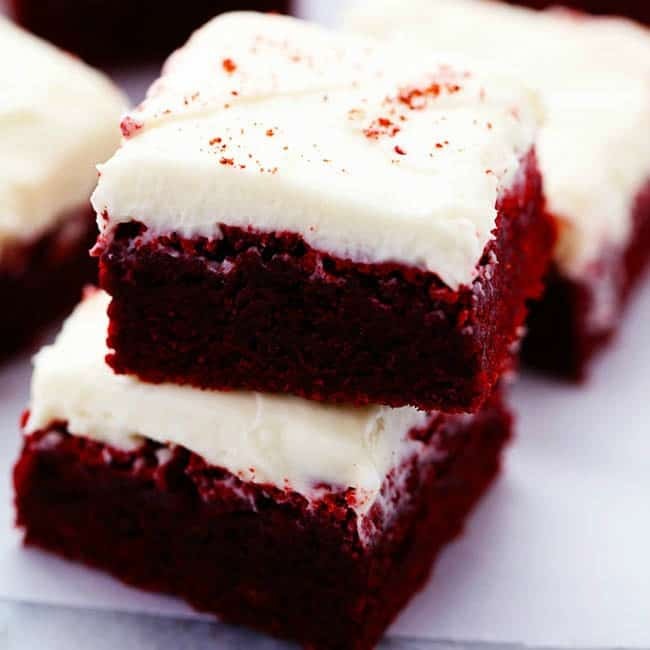 How do you make cream cheese topping for brownies? Using a stand mixer or hand mixer add the softened cream cheese and butter and beat until smooth. Add the powdered sugar and vanilla and continue to beat until smooth and creamy. Frost the top of your cooled brownies. What is the best way to cut brownies? Let the brownies cool in the pan, chill in the fridge and then cut. You can also bake in muffin tins for easy removal. I couldn’t eat this brownie fast enough. It made all of my hard work this month so worth it! With Valentine’s Day just around the corner you have got to try these out. Valentine’s Day or not, you will want to make this all year long. They are seriously one of the best and easiest brownies that I had made. Trust me when I tell you to make them! They are sure to be a huge hit! Preheat oven to 350 degrees. Line a 9x9 or 7x11 inch pan with aluminum foil allowing 2 inches to hang over the sides. Lightly grease. oh yummy! I know I would love these! Alyssa, what is the red sprinkled on top of the cream cheese? 🙂 I wasn’t sure if it was red sprinkles? It adds that tiny little ‘pop’ to the brownie. I am trying these this week!! 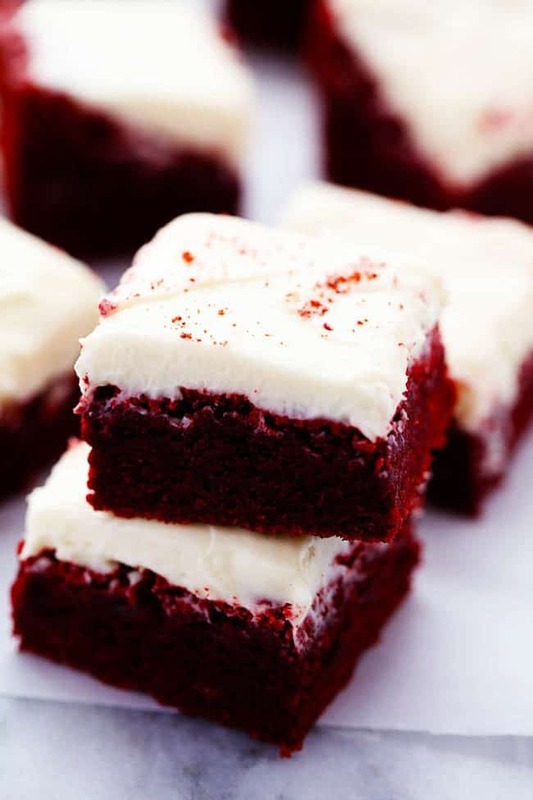 Mmm, these look pretty perfect and a great time saving alternative to a red velvet cake. These look delicious! Is the pan 9×9 or 9×11″? Thanks! Sorry I just fixed that. It is a 9×9 inch or 7×11. My new birthday treat next year!!! Is this a 9×9 or 9×13 pan? These taste delicious! Unfortunately, the tops of mine cracked and caved in quite a bit. (Other people who made the original recipe at My Recipes had similar problems.) No matter, I spread on the frosting along with some red sugar sprinkles, and nobody in my family cared. I am allergic to red food dye..is there anything I could substitute for that? What measurement if its cocoa powder that well use instead of the chocolate bar? I’ve just made your brownies and they are good but I had a big problem with the frosting. Please help. 🙂 If 1 1/2 cups powdered sugar is really 180g (found that on the internet), it is too much sugar. Did I got something wrong or…? I have these in the oven right now, was reading comments and noticed there was a link to original recipe, there is salt on that one but not this one! I did not use salt, are they gonna be ok? Does person need to use a cake pan or will an 12X17 jelly roll pan/cookie sheet with 1 inch sides work for a double batch? This is the BEST red velvet brownie/cake I’ve ever tasted. It’s moist and the flavor is out of this world. Mine came out more cake-like and honestly it was so good I could have eaten just the cake part by itself – no frosting needed. And speaking of the frosting – it was delish! I thought the same thing!! I am so glad you loved them just as much as we did! Do you think this recipe would work for cupcakes? And if so, do you have any idea how many it would make? I made this recipe and everyone raved about it(including myself – see above post). I’ve been asked to bring cupcakes to a party and would love to try this as cupcakes. What are your thoughts? Thank you! I’m sorry, but this is a terrible recipe. I followed it to a T and my brownies(if you can even call them that) came out greasy, with little to no flavor which is weird considering I used Ghirardelli chocolate and 2 C of sugar. I had to throw most of the batch away, as it wasn’t even worth eating. The frosting recipe also produced a sickly sweet glaze that did not even closely resemble the frosting in the pictures or frosting in general. I attempted to rescue it by adding in whipped cream and raspberries which did help the flavor and consistency, but unfortunately could not help the brownies. Honestly, don’t waste your time and ingredients, and go find a better brownie recipe and just add food coloring to that. Maybe there was something I did wrong, but I’ve made brownies from scratch plenty of times and they’ve never come out this bad. Also, this recipe is crazy unhealthy as it tries to fit two whole cups of sugar into a single batch of brownies…as well as four eggs which basically makes it a cake. Something had to not have turned out because this recipe is AMAZING! It is one of my favorites and it has never received a bad review. I am shocked that it didn’t turn out for you. I am tempted to not even post this comment because I don’t want people to not make it because of your review. This recipe is awesome and has been tested many times and we love it! The frosting is the BEST part so something went wrong somewhere. And usually brownies require a lot of sugar and aren’t the healthiest but I live a healthy lifestyle and it is ok to indulge every once in a while. i agree with Alyssa, I’ve made these browines and she’s right, they were AMAZING ! my hubs loves red velvet anything and i made this last week ! i’d try it again if i were you, there must have been something you forgot to add or added too much. Just made these and they are so good! I even licked the bowl lol! Yeah these brownies rock! I had to improvise the pan size and cook time and ended up overcooking them a little bit but they still turned out awesome. Moist and tasty! They are my favorite!! I am glad you liked them as much as we did! Hi. Is 1 1/2 of the recipe be ok if I use a 10x 14 pan? Thanks! You need to double your recipe for a 9 by 13 pan, so if you use a 10 by 14 pan, it will make the brownies a little thinner. If I double the recipe, could I use a 9×13 pan? Yes, you should double your recipe for a 9 by 13 pan. These turned out amazing! Mine were slightly more cake-like and required a little extra time in the oven, but that’s not a problem in my house. Will definitely be making again! Thank you! I always read reviews before attempting any recipe and wonder why you’re not answering questions regarding the use and amount of cocoa to use instead of a chopped baking bar? It appears to be a valid question. These were really good but they rose much more than expected and did not seem done. As a result, I overlooked them. :(. But I trimmed an inch off the sides and they were a hit. I used less powdered sugar in frosting as well! I will make these again! The best RV Brownies i ever made.! The flavor is devine with gorgeous color. Cannot stop eating it. But, just a quick question, why is my brownies still wet in the middle even after 50 minutes (same temperature)in the oven? Can you suggest any solution? I’m not sure if it’s undercooked or that is the texture it was supposed to be. But, apart from that, this is the besttttt!!! Try covering the pan with foil and baking them for another 5-6 minutes after the suggested time. This usually helps solve gooey centers! hi , i would like to try this recipe what are te measurments in grams and ml ? i never understoot the cups table spoons thing. oven so my husband went to Home Depot and bought a new element for the bottom of the oven. The second batch is in the oven now and it’s appearing that the same issue is going to be the case. I don’t know what I’m doing wrong. The batter tastes delicious so I know they’re going to be fantastic I just cannot figure out what’s going wrong in the oven. Should the top be coming out so hard? Will the icing soften it after I put it on? I don’t know what else to do at this point. I’m using a 9×9 pan. I DON’T USUALLY LIKE WARM CAKE OR EVEN WARM BROWNIES, BUT I AND MY FAMILY WENT CRAZY FOR THESE NOT LONG AFTER THEY WERE COOLED! I USUALLY LIKE MY CAKE COLD AND MY BROWNIES ROOM TEMP. – I DON’T KNOW WHAT THESE WILL BE LIKE CHILLED THIS TIME BECAUSE THEY ARE ALREADY GONE! THE FROSTING WAS PERFECT AND NOT TOO SWEET AT ALL, PLUS THE CONSISTENCY WAS FLAWLESS AND CREAMY. WE WILL BE MAKING THESE FOR MANY YEARS TO COME AND SAVE THIS RECIPE FOR CHRISTMAS OF COURSE! I know my daughter would love these for her birthday and cupcakes would be so much easier for traveling and serving. So I’m wondering if you think this batter could be put in cupcake liners and baked. If so, what would be your recommended time and temperature? Thanks so much. I haven’t tried the recipe yet but they sound good. I was reading the recipie, and it said line it with aluminum foil. Could I also use parchment paper? In step 2 when you say whisk in sugar and eggs to melted butter chocolate mix, can I use an electric mixer through out the whole step 2 or is whisking then stirring by hand best? Also after frosting the cooled brownies, should I let it set completely on the table in room temp or in the fridge. Just one more question, when ready to cut the brownies which is the best way to do so since they are frosted? I usually slice brownies with a pizza cutter. Would it be best with a knife? 1. Whisking is best so you don’t over beat it. 2. Room temperature is best then going in the fridge helps set them firm in their place. 3. Pizza cutter is great! 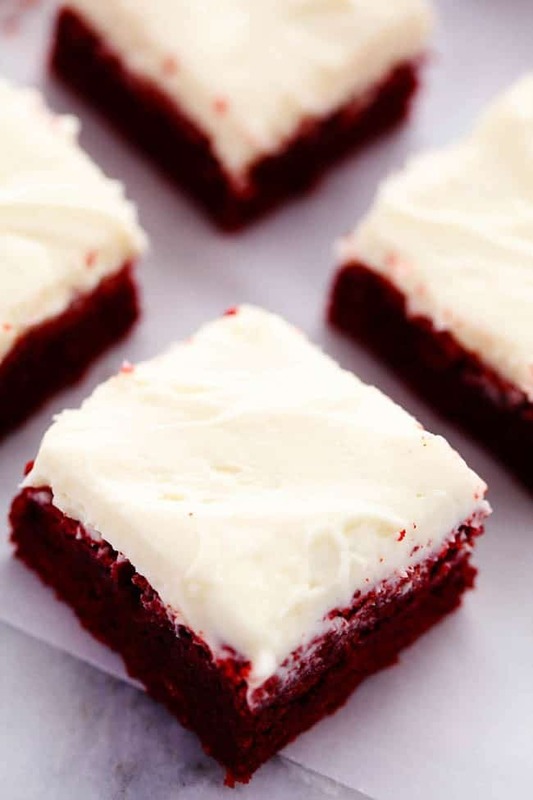 You will just want to wipe off the frosting each time you slice a row to have clean cuts. Beautiful as usual ! Thank you so much ! What about storage of these? Do I need to put them in the fridge or will they be ok in an air tight container until tomorrow? What is the depth of the pan you used? Thanks! I halved this recipe, did it in an 8×8 pan and baked them for 35 minutes. The texture was perfect! I saved time/effort by buying pre-made cream cheese frosting. Only thing is they weren’t chocolatey enough for me- I would add more next time. Made this afternoon yum yum the frosting is prefect and so smooth . I followed to T and was great !!!! I’m wondering what is the purpose of lining the pan with aluminum foil? Just easy clean up? Can I skip that step..? It is easy clean up but it also does help with the baking. You can omit it if you prefer. I bake all the time but these brownies had a thick meringue like crust across the whole top. When I tried to cut them, the top crumbled and was about a half inch or more higher than the brownies underneath. The brownies were moist and cooked perfectly, but I could have never frosted them like they were. Any ideas? I’m at the grocery store and I see several types of chocolate bars. Is it semi-sweet chocolate bar, bittersweet with 60% Cacao, or unsweetened with 100% Cacao that is used in this recipe??? Just want to clarify this because I don’t want my brownies to taste bad because I got the wrong type of chocolate. I’m having trouble with the icing. I don’t know if I’ve done something wrong or it’s my ingredients (buying in the UK), but it’s really runny. I tried adding more sugar and beating it longer. Should I have beaten it more before adding the sugar maybe? Oh no! I am sorry that you are having troubles. If you add the ingredients and it is still runny you will want to add more powder sugar until it is at the right consistency that you like. Hope that helps! Ok so I made these over the weekend and I had some baking issues, after 40 minutes the top was solid hard but super raw inside so I had to keep them in the oven, and i would say they needed like a total of an hour before they were actually done. So because of this the sides were pretty dry, middle was moist. I used a 8 by 8 inch pan lined with foil because I didn’t have a 9 by 9. I also thought they weren’t very sweet, I used bittersweet chocolate bar at 60%cacoa. My husband really liked them and ate most of them and I would really like to make them again. Wondering what I can adjust to make them taste better and bake better…??? Oh bummer! I am so sorry there was so much trouble with them. I have not had that happen before. The one inch difference can make a huge difference since they need more room to cook through. Next time you can lower the temperature on your oven and bake for a longer time if you are using an 8 x 8 inch pan. The chocolate bar should have been accurate and sounds like you were doing everything correctly according to the recipe. I apologize for all the problems you were having. Just made these and they were so good! Especially the icing. I will be saving the icing recipe to use for other things and ill be sure to try your other recipes! Thanks for this.